Article medicale Tunisie, Article medicale Cadmium ; oxidative stress ; antioxidant activities ; Vitamin E ; Calcium. Introduction : Cadmium (Cd) is a toxic heavy metal used in various industrial applications and therefore can cause, both by environmental or professional exposure, several damage in all body systems. 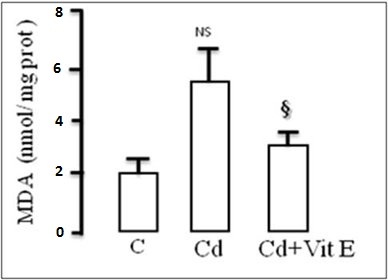 The present study was developed to determine the toxic effect of high dose of Cd on the rat’s liver as well as the putative protective effect of vitamin E.
Methods: During the experiment, rats were administrated Cd per orally (PO) (15mg/Kg bw) alone or associated with an intraperitonial (IP) injection of alphatocopherol (Vitamin E) (300mg/Kg / day) for three weeks. 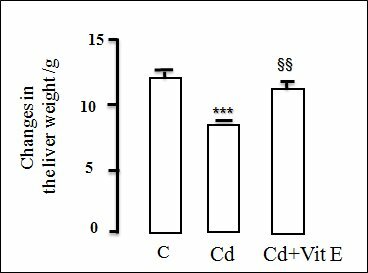 We analyzed the effect of vitamin E on Cd induced liver remodeling by hematoxylin-eosin staining (HE), and by the determination of the antioxidant profiles and lipid peroxidation in rats’s livers. 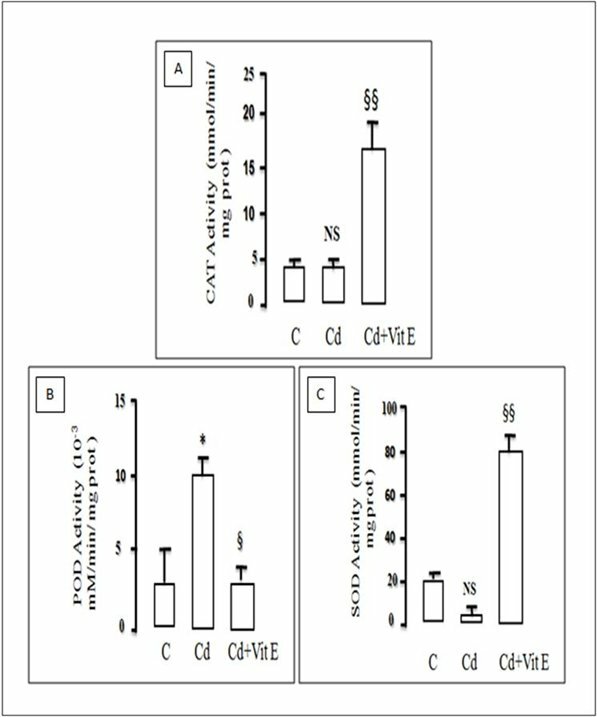 Results: Data confirmed that high dose of cd induced a loss of the liver weight and a pro-oxidative state into hepatocytes characterized by increased malondialdehyde (MDA) and peroxidase (POD), no changes in catalase (CAT) and a decrease on the superoxide dismutase (SOD) activities. These disturbances may be explained by a decrease in the level of hepatic calcium (Ca). Co-treatment with Vitamin E, decreased MDA and POD activities, increased CAT and SOD activities and restored Ca level. All these corrections were accompanied by an improvement of the liver ‘s structure. 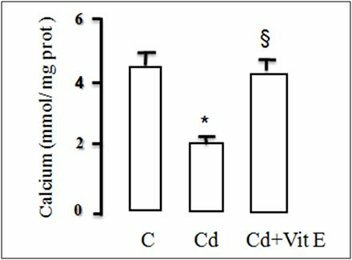 Conclusion: Our results suggest that Cd induced an oxidative stress into rat liver and Vitamin E exerted antioxidant properties which can be mediated by the modulation of Ca level. Cadmium ; oxidative stress ; antioxidant activities ; Vitamin E ; Calcium.